A friend had given me some strawberries and a few of them were getting a bit on the mushy side. So, all three of the new or expecting does received a special surprise with their food this morning. Moonbeam never eats her meal before I close the cage, so she’s just eying me right now. Moonbeam is the best mom out of all the rabbits. She goes out of her way to keep her babies (kits) happy. To start out, she completely fills the nest box with her hair. Imagine having to pull out the amount of hair shown here. I’m always careful opening the top of the nest box. It’s important not to upset the mom. She could possibly choose to abandon her babies, so I open the lid carefully and then wait to see if she pokes her head in to watch me. Moonbeam trusts me, so she calmly sat outside the nest box and ate breakfast. She still watched me, but she wasn’t anxious about it. This view of the hair gives you an idea of just how much she pulled out (I shot her good side for the photograph). I never touch the hair or the kits. A number of texts that I’ve read say it’s permissible, but I’ve had does reject their babies because of the human scent on them, so I choose not to take the risk. I carefully moved the hair aside to count eight pudgy babies. The babies are born blind and hairless. They’re actually quite small at this point. It’s important to remove the hair just long enough to count (and take a picture in this case). Otherwise, the babies could get a chill. You can only see three of the kits in this picture. There is so much hair that I can only move a small part of it at a time. I definitely don’t want to force poor Moonbeam to pull out any more. 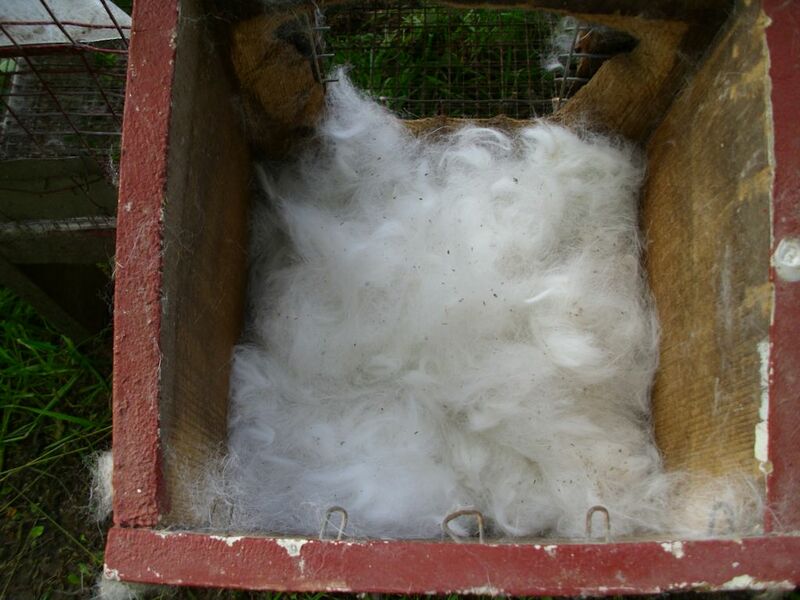 Notice that you can clearly see the head (with ears) of one of the kits. This one will likely be completely white. 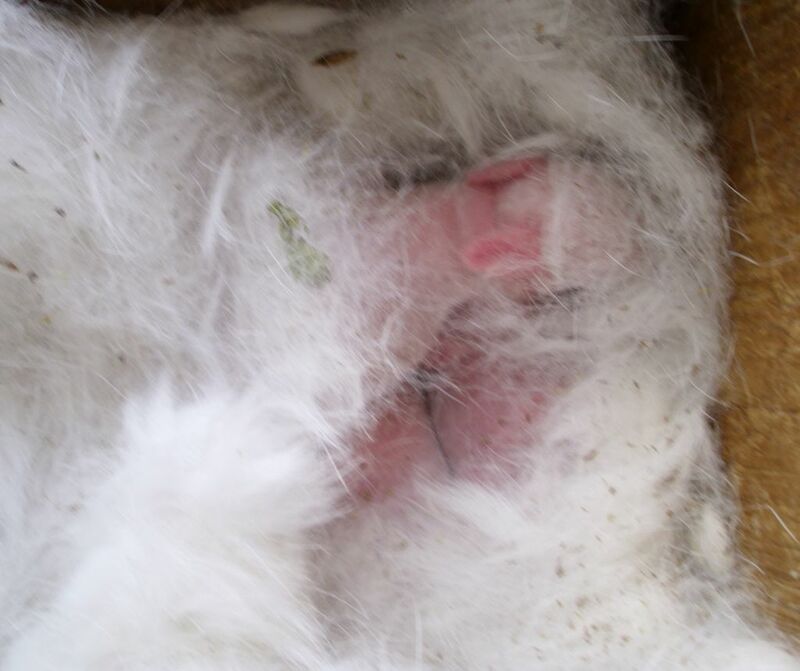 The other two kits have blotches that indicate they have black spots like their dad. Moonbeam actually required 32 days to have her babies. The average time is about 30 days. That’s part of the reason that these kits are a bit bigger than normal. 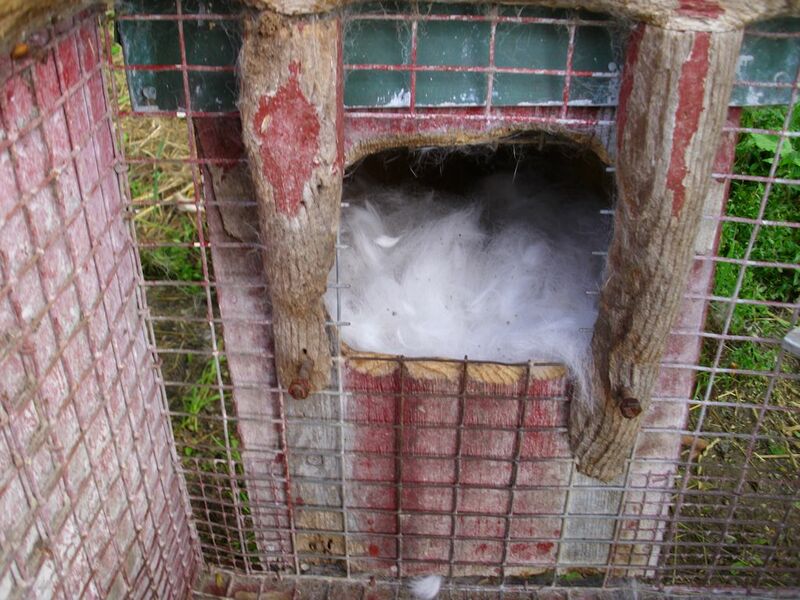 The kits will probably stay in the nest box for the first 30 days or so of their lives. It just depends on how fast they grow. During that time, Moonbeam will feed them each day. 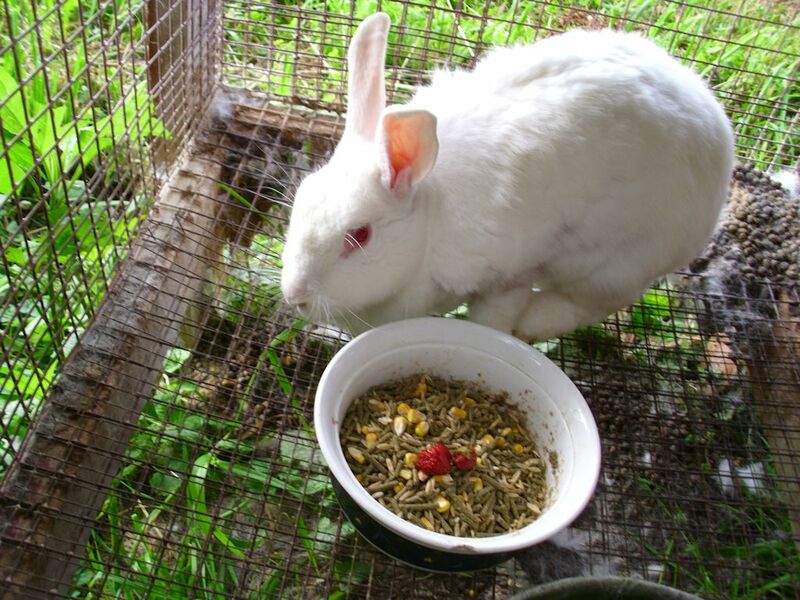 Let me know your thoughts about raising rabbits at John@JohnMuellerBooks.com. I had forgotten that you had rabbits. So precious!! You’ll be amazed to see just how fast they grow.